At LeTourneau University, we implement engineering design and project-based learning throughout our entire curriculum. During the senior year, engineering students participate in a year-long capstone project as part of a multi-disciplinary teams. LETU students complete a wide variety of projects that involve collegiate competition, applied research, industry skills and humanitarian service. These team projects embody the learn-by-doing philosophy for which LETU is known. This is a follow-on project from 2017-2018 to develop a CubeSat called LetSat. The first year of the project selected a payload that uses a general-purpose graphics processor (GPGPU) to execute AI software to process images of the Earth. The goal is to autonomously determine the satellite’s position, attitude and altitude. A 2U structure was constructed and tested on a vibration table with representative mass simulators. GPU’s were procured, and AI software written and tested. This year’s goal is to expand the structure to a 3U size, determine the configuration of subsystems, and test this configuration on a vibration table. Additionally, a thermal analysis of the satellite will be done, and a thermal vacuum test of the payload (GPU and support equipment will be done. Also, we will determine the requirements for the optics, port the software from a development unit to a flight-like GPU and specify the required subsystems hardware. There are about 3.5 M wheel chair user every year and that number is expected to rise as the population ages. In addition, countless other people need assistance to walk. Most people use walker, canes or other mobility assistance devices when they are recovering from leg injuries or have any other mobility impairments. However, there are currently few devices that can be used by people with disability to smoothly transition from wheelchair or walker to the car or from the car to a walker or wheel chair. This problem has led to shoulder dislocations and other injuries as the patients try to get in and out of the cars. This project aims to solve this problem by designing, building and deploying a device that let people with disability to transition from wheel chair or walkers to a car and from the car to a walker or wheelchair with ease. The objective is to utilize the existing bucket seat as the wheel chair; the disabled person will be removed and inserted into the automobile by way of the existing seat. The mechanism the team will be charged with designing will be contained below/within the car seat and latch/unlatch to allow the person to be inserted/removed from the automobile and transported elsewhere without ever exiting the seat; the car seat could be removed and rolled into a home, hospital, nursing home to retrieve the patient/ occupant. Thereafter, the car seat and patient could be rolled to the car and transitioned into the automobile without the patient having to exit the car seat. The transition from car to wheelchair is difficult for many disabled people, therefore a device of this design could consolidate the burdensome process for those that cannot accomplish the physical challenge, not to mention dealing with the burdensome transportation of a conventional wheelchair. A low-cost device for measuring the thermal conductivity of pipe geometry insulation is proposed. Some initial work is based on a 2-inch nominal diameter pipe with inch thick insulation. This is in response to ASTM WK58244-1 which concerns development of a new standard — Standard Test Method for Steady-State Heat Transmission through Pipe Insulation Operating at Below-Ambient Temperatures. The design is based on a heated inner pipe that is covered by insulation and immersed in a bath that can be at different temperatures; (a) room temperature (290K-300K), ice bath (273 K), and liquid nitrogen (80 K). This device would provide data for most commercial low temperature systems such as LNG which operates around 112 K.
With the goal of making wheelchairs strong and inexpensive, sometimes ease-of-use has been compromised in developing countries. One part of making chairs easier to use is utilizing components that roll easier. Previous senior teams have built a rolling resistance measuring machine for measuring rolling resistance of wheelchair large wheels. This year the project will be to use that machine to characterize wheels for manufacturers from around the world. The design goal will be to adapt the machine to also measure rolling resistance of casters and use multiple measuring instruments. The team's work is anticipated to result in a nationally recognized journal article or conference presentation. Advanced high strength steels consisting of a dual martensitic/ferritic microstructure (so-called “dual-phase” steels) offer exceptional strengths, exceeding 1GPa. These steels find application in automotive applications in sheet form. During resistance spot welding (RSW) of DP steels, softening occurs in the heat affected zone, and can negatively affect crash resistance. There is a need to better understand the interaction of cracks with the weld nugget (fusion zone, FZ) and the softened HAZ regions. The goal of this project is to design a test to produce simulated weld microstructures in DP steels and subject those FZ/HAZ weld zones to crack-tip opening displacement tests to quantify the crack/weld interactions. Applications of bulk metallic glasses (BMGs) largely rely upon monolithic formed or molded components due to challenges associated with heat-induced crystallization during welding and joining processes. Harnessing the outstanding mechanical properties of BMG materials as components in structures requires an improved understanding of the response of BMGs to welding-induced thermal cycles and resulting propensity for crystallization. While numerous studies have reported specific BMG material responses to specific welding processes, a predictive physics-based model, valid for numerous alloys and processes, is presently lacking that predicts the ease of welding BMGs without crystallization or cracking. Our objective is close this gap by developing a comprehensive physics-based model for predicting the likelihood of crystallization under fusion-based welding processes. We will complete this objective through a three-pronged strategy of experiment, computation, and analytical theory. While there is a fluids lab system in the ME Laboratory, it has not been used for many years. This project proposes to modernize the existing equipment into a functional fluids lab apparatus that will demonstrate such fluid mechanics properties as head loss, minor losses through fittings, valve flow coefficient, piping resistance coefficient, laminar and turbulent flow, pump horsepower and efficiency, relative roughness, and other fluid flow property. Measurement will include a combination of manual gages and electronic sensors for data acquisition and analysis; the existing manometers will be eliminated. The electronic data system will be designed to interface with LabVIEW data acquisition and display. The display (monitor) will also include an animated explanation of fluid mechanics principles for demonstration on tours and previews. Developing a bird chasing and managing platform using autonomous ground-based vehicles. Primary objective is to design and create autonomous ground-based drones to influence the behavior of birds (especially Canadian Geese) to find safer and less intrusive nesting grounds and prevent damage to business property (such as golf courses, airports, cemeteries, etc.). Utilizing new RF ADC and DACs with GHz sample rates and wide bandwidths, along with DSP techniques in FPGA and with other necessary components, develop vector signal transceiver (VST) instrumentation that both generate and measure RF frequencies from the 1st Nyquist zone to the highest Nyquist zone practically realizable. All signals will be phase coherent, making the instrument(s) suitable for MIMO and Phased-Array applications. Each IO channel should be software selectable for Single-Ended or Differential Operation. The initial phase will be developed using commercially available evaluation modules from the IC manufacturers. The Aircraft Carrier Deck Motion Compensation project sets out to develop a hardware-in-the-loop (HITL) simulation test of a real-time implementation of an advanced flight control algorithm called Model Predictive Deck Motion Compensation. The LAMP team will join a leading industry team of electrical, aerospace, and software engineers to develop and demonstrate new algorithms to autonomously land large unmanned air vehicles on aircraft carriers in challenging ship motion conditions. Gain experience in Agile software development methodologies while working on cutting edge controls research. Over the past decade 3D printing has become big business in prototyping and rapidly gaining traction in production processes. Likewise, groups around the world have begun experimenting with and developing mechanisms for 3D additive construction of buildings. Regulatory bodies in the construction industry are seeking data on which to base new codes and specifications to provide standards of life-safety and quality. The purpose of this project is to develop a 3D tool carrier as the central module of an additive construction platform designed to be a test bed for innovation in additive construction techniques and materials. This year, the senior design team is developing the parameters and specifications necessary to build a construction scale 3D printer. They will verify their parameters and specifications by building a single axis of the machine and testing the protocols for that one axis. Over the next two years, teams will build the three-axis device and various extrusion heads to mimic common systems used in the industry, then they will use the devices to construct common structural shapes using various cementitious materials and techniques. After testing and evaluating the bulk material parameters of these samples using standard mechanical testing procedures, future students will be able to provide this needed data to the industry as a whole. Lazy rivers are large scale, man-made structures that circulate water around a meandering path of various cross sections. When starting from a stationary state, the large volume of water contained in the lazy require significant energy addition from large pumps to increase the water velocity to the desired rate. Once the water velocity has stabilized, the water’s own momentum will continue moving the water allowing for reduced required pumping energy input. Despite the significant costs associated with construction of the river, purchasing and installation of the pumps, and electricity costs of continuously running the pumps, little is known about the key properties that affect pump selection and electricity cost. According to a local engineer who routinely designs lazy rivers in east Texas for water parks, “rules of thumb” design criteria are used rather than site-specific dimensions when sizing and operating the pumps. This likely results in oversized pumps and excessive electrical costs for the client. The purpose of this project is to determine the key properties that determine required energy input during startup and steady-state operations. Over the fall and winter months, these components will be identified and evaluated theoretically, using computer models, and experimentally, using a student built, small-scale mockup. In the spring, the student will set up flow sensors at a nearby lazy river and evaluate the correlation between their theoretical model and actual lazy river to validate and improve the model for implementation by design engineers. Each of the last two years, the SafeHome team was able to participate in a disaster shelter design competition sponsored by Samaritan's Purse and hosted by John Brown University. 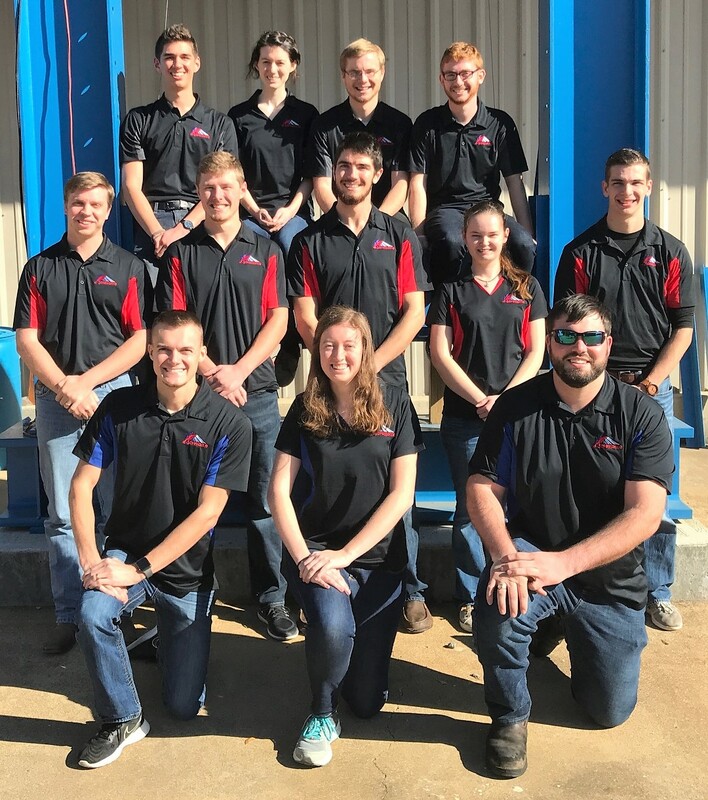 The LeTourneau University team was able to take home 1st place in the competition in 2018. This year, the SafeHome team has three components: (1) One sub-group of the SafeHome team will provide a new entry in the 2019 JBU/SP disaster shelter design competition. (2) The second sub-group is working on a longer-term disaster shelter research effort by designing, manufacturing, and evaluating a full-size modular wall panel made from innovative materials. (3) The third sub-group is working directly with Samaritan's Purse to provide engineering support for a tornado-resistant safe room design to incorporate into new home builds. Visit the SafeHome Facebook page for more information. Transfemoral amputees do not possess muscular controls at knee and ankle joints, which leads to many undesirable biomechanical and physiological consequences. Last year a Senior Design team worked to reduce knee buckling (one of the causes of falling) by designing a novel knee joint with a switching mechanism. This year we aim to design an integrated prosthetic system consisting of the knee and ankle joints with a foot to further improve the biomechanics of amputee gait. Specific focuses are: 1) improving the knee and redesigning the activation switch to increase toe-clearance during the prosthetic leg swing; and 2) designing an ankle-foot unit to facilitate shock absorption and energy return in conjunction with the activation switch. The system may be either mechanical or electromechanical but should be cost-effective. Presenting the analysis results of this project at a scientific conference will be encouraged. The goal of the Engineering World Health (EWH) project is to design and build a low-cost item of medical instrumentation that can be used in the resource-poor developing world. Challenges include the lack of reliable power, minimum local parts, few trained personnel, and need for robustness. EWH has been interested in such devices as low-cost ECG simulators, blood pressure monitors, and surgical lights. The final prototype will be submitted to the national EWH Design Competition. LETU's Engineering and Engineering Technology programs provide you a broad interdisciplinary background with plenty of hands-on experience.